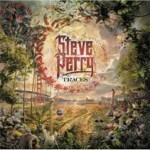 Share the post "Album review: STEVE PERRY – Traces"
That was assumed to be that from this legendary singer, however in 2014 he appeared a couple of times on stage with the Eels, sparking rumours he was recording an album and then it all went quiet until August this year when his social media accounts came alive, followed by a new song, ‘No Erasin’ debuting on 14 August 2018. To say this delighted his many fans would be an understatement! The main drive behind Steve Perry finally recording again was following the death of his girlfriend Kellie Nash due to cancer in 2012 and her making him promise to return to music. The recording of ‘Traces’ started in 2015 with Steve Perry using various co-writers including Semisonic’s Dan Wilson and John 5, with Perry co-producing the album with Thom Flowers. The musicians involved are well respected as you’d expect including former Frank Zappa drummer Vinnie Colaiuta, Pino Palladino, Roger Manning (Jellyfish), Booker T Jones and drummer Josh Freese, who has worked with seemingly everyone from Bruce Springsteen to Michael Buble. Steve Perry still has that voice, albeit this album is stacked in favour of slower songs and ballads, which suit his singing perfectly as can be heard on ‘In The Rain’. With the strings, layered harmony vocals, a mournful piano and that voice, music doesn’t really get much better. There are a couple of rockier moments, first we have the excellent ‘No Erasin’, similar at times to ‘You Better Wait’ off the ’For The Love Of Strange Medicine’ album. ‘No Erasin’ is one of the songs of the year. John 5 chips in on ‘Sun Shines Grey’, which certainly rocks like a good ‘un, complete with a suitably rock fuelled guitar solo. ‘No More Cryin’ harks back to the classic Journey sound of the late 70′s/early 80′s with Booker T Jones guesting on Hammond. His playing adds to the authentic 70′s AOR feel to the song. The one cover on ‘Traces’, the Beatles ‘I Need You’, written by George Harrison, suits Perry’s soulful singing to a tee. This entry was posted in ALBUM REVIEWS, ALBUM REVIEWS (Mobile), All Posts and tagged album, AOR, Booker T, classic rock, Eels, George Harrison, John 5, Journey, melodic, pop, review, Semisonic, singer, soulful, Steve Perry, Traces. Bookmark the permalink.